Acupuncture was first discovered in China 2696 through 2598 B.C. Huang Di “The Yellow Emperor” who was the third great emperor of China. Acupuncture was initiated and discovered during the Yellow emperors reign and the surviving document is the Yellow Emperors Classic of Internal Medicine translation by Ilza Veith, University of California Press, Berkeley, California 1993. This Yellow Emperors Classic text is the basis for acupuncture and was the current book of medical care in 2600’s B.C. The next significant improvement was in 2006 BC through 202 AD during the Han Dynasty. Several important books were written at that time. The Huang Ti Nei Ching Yellow Emperors inner classic was produced with Su-wen (basic questions) and Ling Shu (mysterious pivot) and this last book brought in moxibustion as part of the acupuncture treatment. During the Western Jin Dynasty (265-316 A.D.), the book Zhen Jiu Jia Y. Jing was written (Comprehensive Manual of Acupuncture Moxibustion) is the oldest exiting test of acupuncture and moxibustion only. 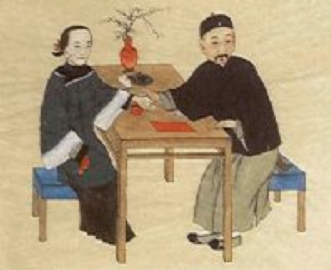 368-1640, The Ming Dynasty, Zhen Jiu Dei Cheng, (Great Compendium of Acupuncture and Moxibustion) serves as a basis for all modern acupuncture treatment. In 1671, PP Harviell, S. J. A jesuit priest who brought acupuncture to Europe via France wrote Les secrets de la Medicine des Chinois, Consitant en al Parfaite Connoissance du Pauls. In 1683, Wilen Pen Rhijne, M.D. wrote a book on “Dissertatia de Arthritide”. Dr. Rhijne was a Dutch East Indian Company fleet surgeon in Japan who provided further delineation of acupuncture treatment. Then in 1758, Lorenz Heister, M.D. wrote an article “Chiraigeies.” He was the first surgeon to recommend acupuncture. Then in 1820 at La Pities, Hotel Dieu La Charite acupuncture was taught in France at some of the best hospitals. With the French leading the way in European acupuncture, the Dutch and Germans followed in suit as acupuncture received a renaissance in the 1820’s. In the United states, Franklin Bache M.D. great grandson of Benjamin Franklin, wrote an article, “Case illustrative of remial effects of acupuncture” showing how acupuncture was beneficial in the patient use in treating the penal system of Philadelphia. In 1916, Sir William Osler B.T., M.D., FBS wrote in the Principles and Practice of Medicine recommended treatment for lumbago was acupuncture. However, after the 1920’s acupuncture was rarely ever used in the United States. In 1971, James Reston reporter for the New York Times with Nixon’s Chinese trip developed appendicitis. The Chinese proposed surgery for his appendectomy using acupuncture anesthesia. His post operative pain after appendectomy treatment was relieved by acupuncture at the Anti-Imperialist Hospital in Peking, China. Then in 1971, E. Gray Diamond M.D. wrote in JAMA , ‘Acupuncture anesthesia, western medicine and Chinese traditional medicine’. He wrote about the experiences in China. It was met with much skepticism. However in 1973, the New York Society of acupuncture for physicians and dentists was formed. This was the first physician and surgeon organization in the United States dedicated towards acupuncture. In 1973, The AMA council of Scientific affairs declares acupuncture an experimental medical procedure.The FDA then required acupuncture equipment to be labeled as investigative devices as recommended by the AMA. In 1983, The American Osteopathic Association endorses the use of acupuncture as a part of the practice of medicine. In 1987, The American Academy of Medical acupuncture was formed as the first national physician and surgeon organization dedicated to the advancement of acupuncture within America. In 1991, thirteen states and the district of Columbia regulate the practice of acupuncture by physicians and 23 states in the district of Columbia establish licensing requirements for non-physician acupuncturist. In 1993, 500 million dollars per year was spent by the United States public on acupuncture treatment. In 1994, NIH and the FDA, reviewed the investigational designation of acupuncture needles. In 1996, the FDA reclassifies the acupuncture needles as Class II medical devices. In 1996, 11 states in the district of Columbia regulate the practice of acupuncture by physicians. 26 states in the district of Columbia provide licensing regulations for non-physicians. Non-physicians are presented by various organizations including the Council Colleges of Acupuncture and Oriental Medicine, the National Commission for Certification of acupuncturist. Many physicians in the United States began to receive training at UCLA in 1982 and to this date under Joseph Helms M.D. These physicians learn traditional Chinese medicine, French energetic, five element, neuroanatomic, auricular and hand acupuncture. These acupuncture treatment systems and microsystems are currently used throughout the United States today along with other microsystems including Yamamoto New Scalp Acupuncture and Chinese scalp acupuncture.